This fantastic Jaguar Mist slot is inspired by the wildlife that takes place in the deepest jungle where the main protagonist, for the title of the game, is the furious but still: elegant Jaguar, this, however, is not the only animal that will be able to be appreciated on the screen nor while the game is being developed, because there are other dangerous animals that make him company in the jungle. Aristocrat Gaming once again stood out by launching this slot game with a stunning quality graphics and sound effects that set the game in a strange way, little in line with the theme but in the end, it turns out to be a little comical too. This jungle is not common, stands out and shows a different charm to not only the common trees, plants that take place in the jungle, like rivers, animals like parrots and toads, other wild as jaguars and leopards. But there is also room for a dolphin and birds like the eagle; which are not jungle animals. 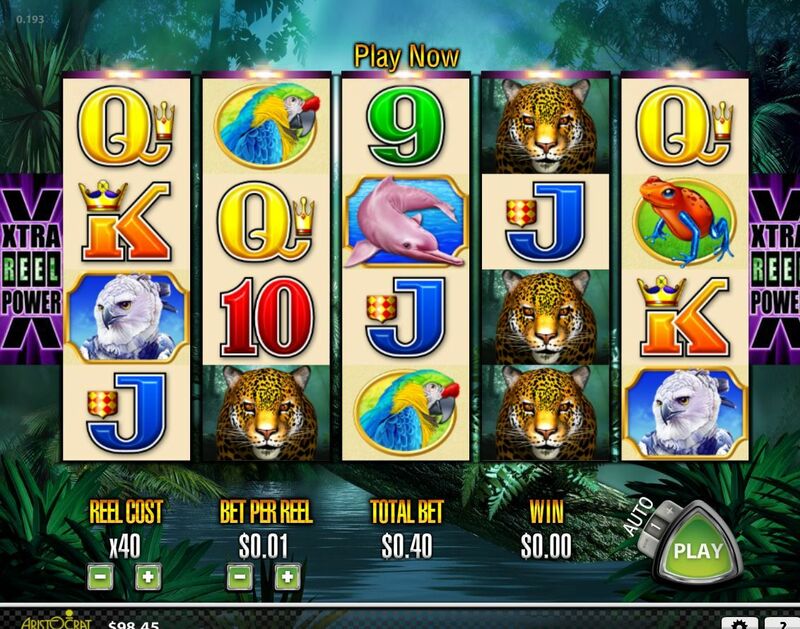 Among other graphics of this slot game, there are the expected and common letters J, K and numbers like 9 and 10. This is not a common jungle, gentlemen. This is Jaguar Mist. Why is Jaguar Mist different from other jungles? Well, in addition to the previously mentioned, the dolphins and eagles; In the Jaguar Mist slots, there is no background music where you can hear a fall of water in the distance or maybe the touch of the trees with the wind and the roar or song of some animal. In this jungle there is a background music that consists of the musical genre known as techno, mostly, that commonly sounds in clubs and bars around the world; In addition to different voices where some chat and others shout, so you can think that it is a kind of land casino. While there are many people who consider it funny for the creativity of putting two things that are not easily mixed, there are other people who do not like the different touch that gives the game. Therefore there is always the option to deactivate the sound and play the game quietly in the mute mode. This game is completely available on iPhone and iPad mobile devices, various Smartphone and computers or tablets, virtual casinos, casinos on land, free versions or where you can bet real money. There is no excuse for not playing this fantastic Jaguar Mist slot! The different, curious and interesting on the screen of this slot game is to get rid of the fog that seeks to overshadow and hinder the player’s vision. On the screen of this game, you can count on a total of five rotating reels and four rows. It has on each side of the reels an “X” and reads “Xtra Reel Power”, up instead of the name it reads “Welcome to Jaguar Mist” and on the sides the name of the company, Aristocrat, takes place. It also has the lower table that records the number of bets per payment rows, the payment rows offered by the game, the total of the bet that turns a red when it reaches its maximum limit and an auto button spin in addition to lines with revealed information on how to obtain prizes and bonuses. As the game progresses: if a winning or some kind of gain is obtained, the screen has an animation that will be activated and the coins will fly out of their places as fountain water. The Xtra Reel Power consists of something extremely simple. Each reel has an individual cost and this is x1, as the game passes it goes up to x5 to x40. The higher it is the more light the reels get. It is quite creative because nobody would like to be immersed in a completely wild Amazon jungle and not even have a torch to light the way or even defend themselves. The possible bet per reel goes from 0.01 and continues increasing 0.2, 0.5, and 0.20, the number you want up to $ 1, expressed in dollars, it is to the currency that this betting machine is expressed in all the places it is. The decision is for the player if he wants to play only one turn or ten, twenty, up to twenty-five turns. It does not have a maximum bet but it also does not offer options to select the payment lines as a convenience, so there is only the possibility of betting the amount of money and paying for the reels that you want to use. In Jaguar Mist you will have to fight to get rid of the annoying fog that takes place in the depths of the Amazon rainforest. Join a new dangerous experience that will fill you with a lot of adrenaline from the beginning to the end. Everyone has always wanted to go into the wild jungle and get out alive. Surprising the wild card in this game is not the expected Jaguar, but the beautiful orchid; she has the power to replace all the others except the scatter chart. The orchid flower has no credit; it appears only in reels number two, number three and number four. Do not forget that if this chart takes place during the free spins, you can multiply the winnings by twice its value or up to three. Therefore the orchid without presenting credits as the gain is still the wild card and multiplier. The jaguar without being wild or scatter has enough value for the players because it grants up to three hundred coins to get five of them in the reels. The graphic of the medal is the scatter and this can award from two, ten and up to twenty coins; eight, fifteen and up to twenty free spins. This depends, of course, on the amount that was obtained from the same graph, if there were three, four or five medals. They can offer up to twenty-seven times the profit obtained. In the round of free spins you can get new free spins that add to the rest; as for example, if the combination of free games was obtained and in the middle of those free rounds, two medallion graphics were obtained in the reels, then five free spins are added to those that have already been won and remain to be played; During these free spins that may or may not lengthen as the game progresses, the player may get prizes for combinations of other graphics. However this fantastic slot game with a wild theme, you can count on a very good amount of games with free spins, but there are no other additional bonuses to this one which can be extremely disappointing. Of course we must take into account that to win bonuses the player must have more than at least three reels, which brings a minimum cost maybe not high but if fixed that rounds specific numbers, so users should touch their pockets, continue to count the money they have there and decide if they risk going into the jungle Jaguar Mist. Of course, this will not be a problem for those who play online for free, because they can spend all their fake money and laugh at the end if they lose it.